We've had so much fun with Jen Kingwell's Delilah program that we immediately signed up for her second block of the month program straight out of Australia to begin March 2018, Golden Days! Golden Days features laser-cut acrylic and mylar templates. Participants receive the templates and block instructions each month over the course of a year. 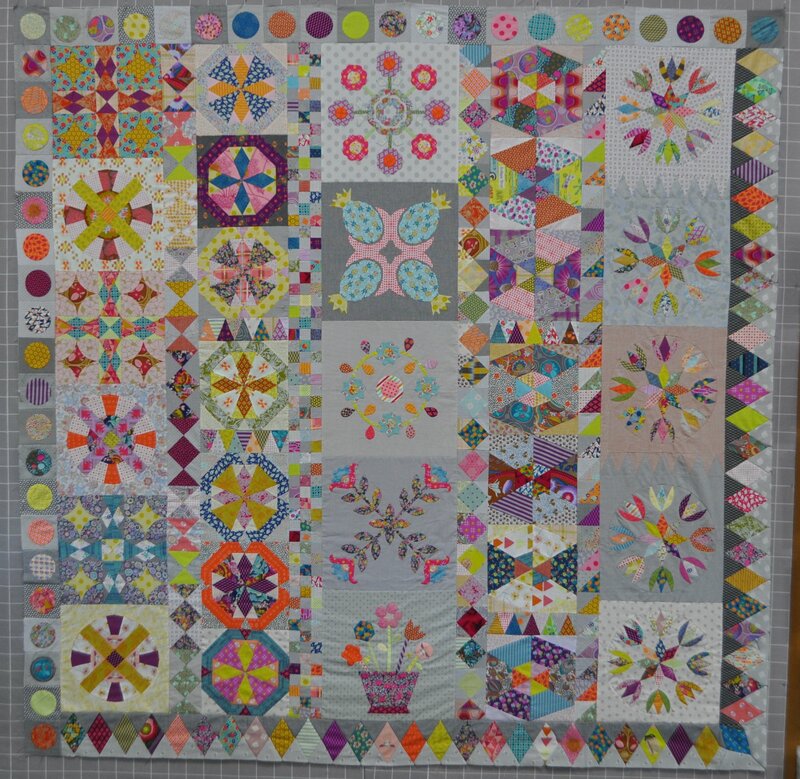 Our fabric option will be similar to the Jen Kingwell blocks seen here. We may offer a second choice of color with darker backgrounds like we did for Delilah if there is enough interest, so let us know if you would like a darker background option. You can sign up for the full year program of templates with fabric to the right. Scroll down to see the other available options. Each option has its own button that will take you to PayPal for a secure way to pay for the template and fabric option or set up installment plans. PayPal is our only option for allowing installment and monthly options as it is a secure way to have your credit card information saved. It is very easy and a nice option to use for times like this. If you do not have a PayPal account, you can look just below the "login" button where it says "No PayPal account? Pay using your credit or debit card" to pay without a PayPal account. * Acrylic and/or Mylar templates and the instructions for the blocks each month. * For those who choose the fabric option, fabric will be handed out quarterly so that you will have a larger selection to play with each month. * Monthly meeting on the 3rd Saturday of the month at 9:30 am for tips on making the blocks by hand or machine. * Includes membership to the By Hand the Art of Slow Quilting monthly stitching time on the 3rd Saturday. * A 10% discount (you can still use your 20% IQ card discounts when you have them instead) every time you shop for the duration of the program. * Fun swag throughout the year. * $330 flat fee for the templates, instructions, meeting time and membership to the By Hand group when paid in full. Does not include fabric. * $440 flat fee for the templates, instructions, fabric, meeting time and membership to the By Hand group when paid in full. * You pay a registration Fee of $40 (for all three installment options) to reserve your spot and to begin the installment payment options through PayPal. * $330 for the template only option paid in full by the start of the program. * $26 per month (12 months) for templates, instructions, meeting time and membership to the By Hand group. The monthly fees will automatically begin 1 month after you register. * $40 per month (12 months) for templates, instructions and fabric, meeting time and membership to the By Hand group. The monthly fees will automatically begin 1 month after you register. If you want to sign up for this program and have it shipped to you, then please email us to let us know and we will send you a separate PayPal button to sign up with shipping included. Sign up for the full year with templates only with a $40 deposit now and a final payment of $300 to save on the monthly payment plan fees. Golden Days Block of the Month $40 Deposit and then $300 final payment installment plan. Sign up for the full year with fabric with a $40 deposit now and automatic monthly payments of $40 to begin March 2018. Sign up for the full year with template only (no fabric) with a $40 deposit now and automatic monthly payments of $26 to begin March 2018. Sign up for the full year with templates with fabric plus shipping with a $40 deposit now and automatic monthly payments of $46 to begin March 2018. Sign up for the full year with templates only plus shipping (no fabric) with a $40 deposit now and automatic monthly payments of $32 to begin March 2018. Requirements: Save over $40 to $80 (depending on which installment option you might consider) by paying for the full year of Golden Days up front!